A spacious three storey, 16th Century townhouse situated on the old High street, and later extended. This Grade II listed house has been modernised and completely refurbished to a high standard, whilst maintaining many Georgian features, including; an original wig cupboard, an oyster cupboard in the sitting room, exposed beams, fireplaces and Norfolk winder stair leading to 2nd floor bedroom. The cottage is fitted with a well equipped kitchen, 2x ensuite bathrooms, 1 twin bedded room, a small child's room, a large family bathroom, and Wi-Fi access. 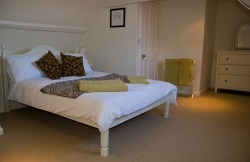 Centrally heated throughout, making Oyster Cottage ideal for all year round use. 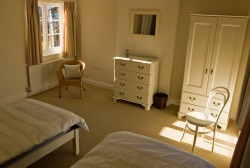 A high chair, cot, bed linen and towels provided (other than beach towels), unless holidaymakers prefer otherwise. The location is on the old High Street which is now residential and very quiet. Shops, Post Office, Bank, Library and other facilities are within easy walking distance. Wells-next-the-Sea is a quaint old fishing port on the North Norfolk coast with a maze of fascinating narrow streets and alley ways leading down to the Quay. Many individual shops, cafes and deli's are to be found, and the centrally located Buttlands surrounded by fine Georgian houses is but a stones throw away. Also to be found on the Buttlands are the well established award winning Crown Hotel, and the Globe public house. The beautiful unspoilt sandy beach is a 20 minute walk away, or take the narrow gauge steam railway. Accommodation offers a large hallway providing space for coats, prams, boots etc. Downstairs toilet with basin, ironing board and iron. Large open planned kitchen and dining area – contains dishwasher, fridge freezer, electric cooker, microwave, cd / radio, and toaster. French windows opening out onto the paved enclosed court yard. 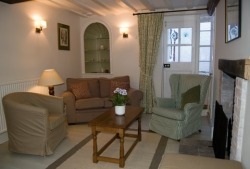 Sitting Room – Settee, arm chairs, coffee table, free view digital TV & DVD player. Small room adjacent with a boiler and washing machine. Glass door leads out into a paved enclosed courtyard. Courtyard – A private enclosed paved garden, with garden furniture, BBQ and clothes line. All rooms lead off a long carpeted landing with 3 bedrooms (1 ensuite) and a family bathroom. Bedroom 1 – with king-sized double bed and ensuite shower room, stripped wooden floor, large walk-in wardrobe with a wig cupboard, drawers. Bedroom 2 – Small single bedroom, with stripped wooden floor. Large family bathroom, with bath and overhead shower, hair-dryer, stripped wooden floor. Bedroom 3 – Large room with 2 single beds, wardrobe, drawers, carpeted. 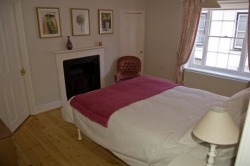 Bedroom 4 - large carpeted room, with a double bed, ensuite bath and shower room, wardrobe, and drawers.